For centuries, the planet Hyllis has been bombarded by a relentless alien race. Skeptical of her government's inability to repel the invaders, a rebellious action reporter named Jade sets out to capture the truth. Armed with her camera, dai-jo staff, and fierce determination, she discovers shocking evidence leading to a horrific government conspiracy, and is forced to battle an evil she cannot possibly fathom. Join the Rebellion As action reporter Jade, join an underground resistance group and expose your government's secrets using stealth, force, and wits. Stop at nothing until your people know the truth. Expose the Conspiracy Enter a futuristic world full of deception, where nothing is as it seems and exposing the truth is the only hope of restoring freedom. Prepare for Anything Brace yourself for any obstacle in this spellbinding world from the mind of innovative game creator, Michel Ancel. United We Fight! Battle against the forces of conspiracy with Jade's punishing dai-jo staff techniques. Master amazing tag-team fighting combos with allied resistance fighters. 2003 Ubisoft Entertainment. All Rights Reserved. 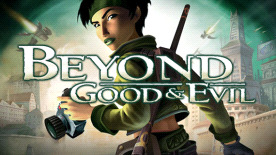 Beyond Good & Evil, Ubisoft, Ubi.com, and the Ubisoft logo are trademarks of Ubisoft Entertainment in the U.S. and/or other countries. Software platform logo (TM and ©) EMA 2006.